Dawsey was picked by the Bucs in the third round of the 1991 NFL draft who, while recognizing his lack of ideal speed, were attracted by his toughness and fearlessness at catching across the middle. 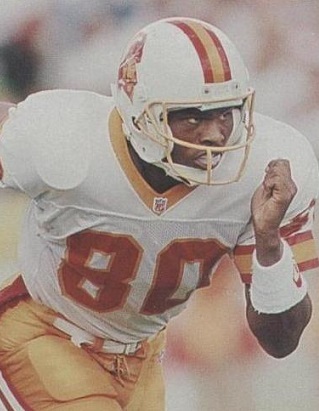 He had also shown a knack for making big plays in college and received All-American recognition in 1990. Dawsey moved into the starting lineup seven games into his rookie season. Buccaneers went 3-13 to finish fifth in the NFC Central. Tough and outstanding at running after the catch, and much admired as a possession receiver, Dawsey caught 60 passes for 776 yards (12.9 avg.) but just one TD in 1992. A major knee injury limited him to four games in ’93 and he missed the first six games of the 1994 season while still recovering from surgery, but had 46 receptions for 673 yards (14.6 avg.) in the remaining 10 games. He was waived by the Bucs after the 1995 season and played a year with the New York Giants before signing with the Miami Dolphins, although he never made it to the regular season with them. He caught 16 passes for New Orleans in 1999, his last season. Overall, Dawsey caught 240 passes for 3271 yards (13.6 avg.) and six touchdowns. He went on to become a highly-regarded college assistant coach and scout.